Learn how Prajakta’s story can change your life! Growing up I always saw my mom searching for new recipes, watching cooking shows and enrolling herself in different cooking classes to learn about new recipes. So, as a child I grew up in an environment where I was introduced to a variety of foods. Due to my Mom´s influence, I have always been keen to try different recipes. As I was growing up, I started helping my mom cook and trying out new recipes on my own. I used to spend hours flipping through the pages of food magazines and would get delighted looking at eye-catching pictures of different cuisines. This also made me curious about recipes from different cultures. When it was time for me to go to college, I was looking at various options related to food. During that time, I read an article which talked about how healthy nutrition and consistent, good eating habits can help you stay healthy and happy. The article also mentioned that the diet filled with whole foods is fabulous for the body because of the synergy that occurs with the naturally occurring vitamins, minerals, and phytonutrients found in food. These nutrients in food work together in beneficial ways for the body whereas a nutrient supplement does not contain all of the known and unknown beneficial nutrients of whole food. This article also featured Ayurvedic medicines and various natural herbs that can help heal our bodies better with minimal side effects. I started thinking that this is so amazing that food has so much power that it can actually treat a medical condition. It escalated my curiosity and helped me appreciate that nutrients in foods and the compounds within the foods all work together to deliver nutrients to body to provide you with optimal health and wellness. Wouldn’t YOU rather improve your health through food instead of supplements? Prajakta has a Bachelor´s degree in Nutrition and Dietetics and also has completed a Didactic Program in Dietetics from University of Minnesota. She has been awarded “The certificate of training in Adult Weight Management”. After my first year in college, when I was doing an internship at a local hospital, my grandmother was hospitalized for high blood sugar. Feeling like I needed to do whatever I could to help her, I got involved in her care and learned everything that I could about her condition from her primary care physician. After she was discharged from the hospital, I made sure she followed the diabetes diet guidelines I had researched. Due to the changes in her diet, my grandmother had a tremendous recovery and her blood sugar came well under control. Her doctor was extremely happy and surprised to see her progressing so quickly at the age of 78! Looking back on this experience today, I am almost certain that nutrition played a vital role in her speedy recovery. The experience was also a real turning point: Seeing a close family member recovering so well by following a healthy diet, I was sold on the power of nutrition in treating medical conditions and enabling individuals to lead long and healthy lives. I was diagnosed with Type 2 Diabetes and referred to Ms. Apte at Right Nutrition Works by my primary care physician earlier this year. 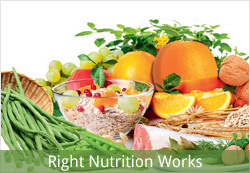 I have attended three sessions with Ms. Apte and am extremely pleased with her approach to nutrition. She thoroughly explained both the disease itself and the importance of good nutrition in relation to the successful management of Type 2 Diabetes. After testing me for food allergies, she suggested a variety of individual brands of healthier foods which I would be able to substitute for my regular foods without exacerbating my food allergies or causing issues with my medical condition. I am very impressed with both her kind and caring manner as well as with the knowledge and expertise she demonstrates in regard to nutrition and health. I would highly recommend Ms. Apte to anyone struggling with nutrition-related medical issues or to anyone who wishes to learn to eat in a healthier manner. I started my career working as an inpatient dietitian, where I could get a diverse experience working in a hospital environment. Though things were going well, I was not completely satisfied with counseling sessions for patients before their discharge. People in the hospital are admitted for one or more medical reasons and naturally, their biggest concern is to treat the medical condition first that they are admitted for. Hence, learning about eating a balanced diet and making healthy food choices is not on top of their mind in most cases. I was also not pleased that it was difficult for me to provide a well-rounded nutritional education to my patients due to limited time. Learning about nutrition cannot be achieved in just a quick 15-20 minute session. It´s a skill that a person needs to acquire and makes as a part of his/her life, in order to experience a permanent positive change. Creating a healthy lifestyle is a process, and I strongly believe that person needs to have enough time to learn this. Today I´m in private practice and I absolutely love what I do! Now, I can spend an adequate amount of time with my clients to teach them several ways to acquire healthy eating habits and achieve a healthy lifestyle. I am able to offer customized care to my clients by providing easy-to-implement solutions to address their nutrition concerns. I have a tremendous satisfaction that I am with my clients on their journey of achieving their health goals by offering them a constant support and motivation. When my vision was clear that I wanted to help people create healthier lifestyles, the question was how to accomplish it. I started working on how to make living a healthy life simple and easy to understand for my clients. I want my clients to enjoy their journey of transformation and remember it as a positive experience. Through my extensive experience I developed my very own recipe for client success. What I figured out is that there are actually 6 key steps to overcoming your health glitches for a happier, healthier you! Create YOUR formula for a fulfilling and HEALTHY life! I practice what I preach. I maintain a healthy lifestyle and try my best to be a good role model for my kids. However, even I have things to work on. I know leading a healthy life is a process, and I always try to strive for continuous improvement in my own diet. My formula has helped many of my clients improve their energy levels and feel good. When Sarah came to me she was very depressed with a recent diagnosis of diabetes, and the extra weight she carried made her difficult to move around with minimal flexibility. Her grandkids had recently moved closer to her. She wanted to spend as much time as possible with them and wanted to get involved in their care. But her medical conditions were restricting her ability to enjoy with her grandkids, especially her weight. My formula helped her lose most of her excess weight, by teaching her how to make healthy choices and learn new eating habits. She experienced transformative effects! She is now happy because she is able to play and run around with her grandkids and can enjoy every moment with them. She told me that this seemed nearly impossible for her before. Some of my clients had such significant transformations, that they can now fit into the clothes they used to wear in their 40s. I´ve had many clients tell me that their friends, family, and coworkers have noticed all the positive changes and have asked them what their secret was! By following the formula – 6 key steps to overcoming your health glitches for a happier, healthier you – my clients are now confident about what exercises to perform each day, what type of foods to order when they go out to eat, what ideal portion sizes are for various foods, and what healthy quick-fix recipes they can prepare for their families. They are now confident about what is a true meaning of eating healthy. I want more and more people to take advantage of this healthy living formula to help themselves experience BIG positive changes in their health and in their lives. To learn more about my services, so YOU can experience BIG positive changes, click here.